Q - I have a slide mounted optic on my sidearm (MOS, RMR, Red Dot). How can I have a holster fabricated to accomodate? 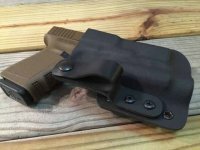 A - Configure your holster/s as normal by choosing the desired styles and configuration options. During the checkout process, there is an “Order Notes” field. In this field, please make note that you have a slide mounted optic, and place a measurement from the front of the optic to the rear of slide. Your fabricator will take care of the rest.